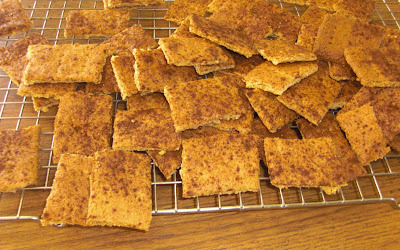 Nothing says an after-school snack like homemade whole grain, refined sugar free, graham crackers. Not packed full of the refined sugar, flour and chockful of preservatives, you feed these to your family with a clear conscience. Use any whole grain flour for these. My favorite is actually a straight kamut flour. But the standard wheat, kamut, spelt mix is great too. These have no refned sugar in them. You can substitute any alternative sweetener, but the classic taste of honey is delicious. Enjoy getting the tips of your fingers wet, dipping these in milk and reminiscing of days past... I also recommend them for tasty, wholesome graham cracker crusts.